Click image for a bigger view of the sketch from which this piece was inspired. 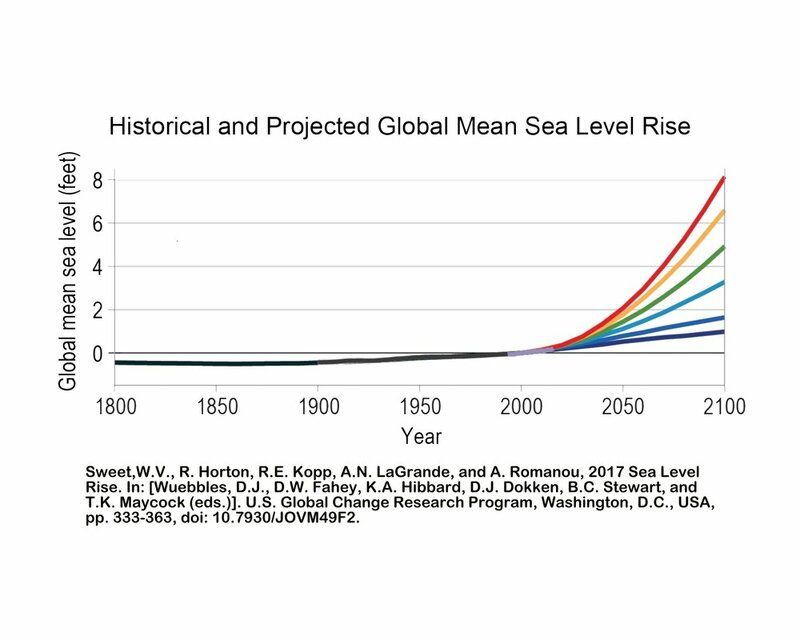 Warming seas and melting ice have caused Global Mean Sea Levels (GMSL) to rise 7-8 inches since 1900. An additional rise of 1 to 4 feet is likely, and up to 8 feet possible, by 2100. Sea levels will be higher than the global average for US Eastern and Gulf Coasts. "Human-caused climate change has made a substantial contribution to GMSL rise since 1900 ..., contributing to a rate of rise that is greater than during any preceding century in at least 2,800 years." Sweet, W.V., R. Horton, R.E. Kopp, A.N. LeGrande, and A. Romanou, 2017: Sea level rise. In: Climate Science Special Report: Fourth National Climate Assessment, Volume I[Wuebbles, D.J., D.W. Fahey, K.A. Hibbard, D.J. Dokken, B.C. Stewart, and T.K. Maycock (eds.)]. U.S. Global Change Research Program, Washington, DC, USA, pp. 333-363, doi: 10.7930/J0VM49F2.